If you are like most teachers I know, you are intent on improving your craft. If your school is like most schools I know, you have spent a great deal of time and energy over the past few years on developing, implementing and assessing curricular standards. But no matter how you feel about the standards movement, I would argue that both these tasks — honing your skill as a teacher and refining your curriculum — are insufficient to accomplish the deeper changes we need to make in our classrooms. What is needed is a shift in focus from curriculum and instruction (what we are teaching and how we are teaching it) to the process of learning, as experienced by our students. This is a subtle but profound shift in point of view, from seeing what happens in the classroom through your eyes to seeing it through the eyes of your students. It is a shift in focus from the act of teaching to the act of learning. This focus on learning will then shape what good teaching looks like. Learning, as always, comes first. If we begin with our stated purpose — preparing students to live fulfilling and productive lives — then establishing the structure for self-directed learning must be the heart of our focus. To accomplish that, the learning process must be designed to be responsive to the needs of every student. Just as you might create a lesson plan to organize your actions as a teacher, you need to create a comparable plan to organize your students’ experiences as learners. You need to create a learning sequence. One approach to designing learning sequences is to imagine the process as a set of building blocks that serve specific functions. This section lists a number of such blocks that can be choreographed into a sequence that optimizes learning. A student can be exposed to new concepts or skills in any form or modality, including listening to a teacher lecture, watching a video, reading a chapter, or doing an exploratory activity like a station lab. It can happen in class or as homework as part of a “flipped” classroom. It can be done individually, in a small group, or with the whole class. Like all of the building blocks in this process, introducing new material can also be a blend of many modes. For instance, good lecturing requires frequent interjections of student activity, whether individual practice or conversational learning, to let them process the new information. Once students are exposed to new concepts or skills, they need to process that new knowledge through exploration and practice. The form of exploration depends largely on the nature of the material. For instance, after reading a short story for an English class, students may be given prompts to guide a discussion to think more deeply about character development, say, or the dramatic arc of the story. Algebra students learning how to graph a function, on the other hand, need to practice solving problems until they reach proficiency. Working as an individual can be useful during the exploration phase, but individual work should be differentiated if possible to avoid forcing students to do busywork. Unless handled carefully, practice can actually be counterproductive. If a student isn’t in her learning comfort zone, independent practice will be ineffective; both busywork and panic undermine the learning process. Exploration and practice in groups can also be used to resolve this problem. Conversational learning enriches the exploration phase for all students, regardless of how quickly they master the new material. Articulating the new concepts or skills. Simply having to express new material in her own words forces a student to work with the problem at a deeper level than, say, highlighting text. Assessing how well she understood or mastered it. This can, for example, be a 1 to 5 scale, where 5 means a student knows the new material well enough to teach it, a 4 means she needs to talk about it, a 3 means she has serious questions about it, and a 1 or a 2 means she is in over her head. Describing, as specifically as possible, what she didn’t understand or master. If it is anything less than a 5, what is the impediment to understanding? Doing these last two steps, in particular, prepares the student to participate in conversational learning, described below. One of the most important aspects of learning occurs when students talk to each other, ask each other questions, teach each other. While conversational learning can occur at any point during the learning sequence, it is most effective after a student has done the individual metacognitive work described above. Now she is ready to join in a discussion with other students. If she has mastered the new material, she should be prepared to teach it. If she still needs to work on it, she should be prepared to ask good questions to continue learning. Because of this preparation, the teaching and learning that takes place during these conversations can be the most effective aspect of the learning process. Along with differentiated learning, it is also one of the prime ways of dismantling the bell curve. Open work time / differentiation. In general, there will be one or more points in the course of any learning sequence when the needs of students diverge. For example, after being introduced to and exploring new material, some students will have mastered it and are in danger of becoming bored, while others may feel lost and confused, and need more time to process it. Differentiation by level of challenge. As described above, some students may need enrichment activities, while others need remediation and more practice. Differentiation by learning style. Since students learn in different ways, the same material can be learned through activities that accommodate visual, auditory, and tactile-kinesthetic learners, for example. Differentiation by pace. Some students learn more quickly than others. If there is a set sequence of activities — say a series of mathematical problem sets of ever-increasing difficulty, or a writing assignment that requires a sequence of drafts — then open work time can allow each student to proceed through a given learning sequence at her own pace. Differentiation by topic. With some activities, such as long-term projects, writing and/or research assignments, scaffolding can be created to guide student choice. The timing of deadlines for various milestones of long-term work can also be differentiated based on the capabilities and needs of individual students. Differentiated learning can be woven into almost any phase in a learning sequence, and can serve specific functions, such as test remediation, exploration of new material in different learning styles, or individual preparation for an exam. Summarizing what has just been learned helps students gain perspective and attach new material to existing understanding. A teacher-led review in the form of a lecture will generally be less effective than a process that requires students to be actively engaged. Whether they are doing presentations, discussing a review packet, or simply engaged in conversation, the more student-directed this phase is, the likelier the review is to enhance their learning. This is described further in "Study Groups: The Heart of Conversational Learning". At some point in the learning sequence, it is necessary to establish the level of mastery students have achieved in a more formal way. In general, such an assessment should be formative in nature, with well-established pathways for students to do remediation work as needed. An essential aspect of formative assessments is the opportunity for a student to learn from her mistakes. The form this remediation takes will depend on the nature of the learning goals that have been assessed. Two broad categories of learning goals are skills and concepts. When assessing skills, there are few practical alternatives to having students demonstrate those skills directly. When a student has not mastered a specific skill, the remediation process should help her isolate the difficulty she is having, practice that specific issue, and assess the skill again. If, on the other hand, concepts are being assessed, the act of learning from mistakes looks different. Depending on the subject matter, conversational learning about mistakes made on tests is often an effective way to isolate the difficulty the student is having. There should also be a process for the student to express what she has learned from those mistakes and to show that she now understands the concept. Every part of a learning sequence should respond to every student’s needs. It shouldn’t be necessary to point out this most obvious consideration, but it is the heart of the transition from traditional classroom techniques to a classroom that is grounded in self-directed learning. This approach requires that the teacher be responsive. Responsiveness is rooted in feedback, which should be given and received throughout the learning sequence. Planning backwards vs. following the child. The phrase “planning backwards” means beginning the design process with the ultimate goals — what a student should know and be able to do — and then create a plan of how to get there. Starting from this point of view, the driving force is the mastery of the curricular standards. In Montessori education, on the other hand, the phrase “follow the child” means paying attention to the interests and needs of the individual student in order to cultivate responsible, self-directed learning. This approach requires more flexibility and differentiation to accommodate the needs of every student. Planning backwards is grounded in the preeminence of mastering academic goals and tends to focus on shaping the teaching process to accomplish that task. Following the child is grounded in the preeminence of the growth of the individual student. This is not an either/or choice, but clearly the two approaches are in tension. The issue of finding a balance between them begins with the question of what is valued most. In practical terms, planning backwards tends to require a more driven, rigorous approach — the sheer volume of required curriculum in most classes compels the pace to be brisk, which runs risk of leaving some students behind. Following the child, on the other hand, considers character attributes like grit, self-awareness, and self-directedness to be of equal or more importance than the curricular mastery often demanded by accepted standards. Controlling the pace of the learning process. The timing of each building block in a learning sequence depends on the students' capabilities and the difficulty of the material. Teachers should allow enough time for each activity for the slower students to be successful. That means, of course, that there have to be more sophisticated and challenging activities available for the students who master material more quickly. If only a few students are proficient, slow down and give them something special to do or let them become “resident experts”, if they are willing. If only a few students are falling behind, provide additional time and support outside of the class in the form of resource centers, peer tutoring, optional homework and the chance to work with you. Another consideration in the pace of the class is a sense of forward momentum. This, of course, is in tension with the idea of letting slower students work at their own pace. Forward motion is important, but so is flexibility, responsiveness, and spontaneity. Going off topic to follow the interests of the class (or your own interests) makes the classroom more interesting and less mechanical. A common and quite understandable barrier to finding the appropriate pace occurs when you commit too firmly to a schedule while planning a unit. The issue of “coverage” will often drown out the needs of the students, particularly those who are struggling. If our goal is genuine learning, those needs must be listened to. Routines help make learning comfortable. Having consistent structures and routines in your learning sequences help ground the student’s experience in a sense of familiarity. A sense of "this is how we do this" binds the class together. Routines about how the period is started or ended, how students go over homework or work together in pairs offers the comfort of familiarity. With practice, students become more effective in activities that are consistent. 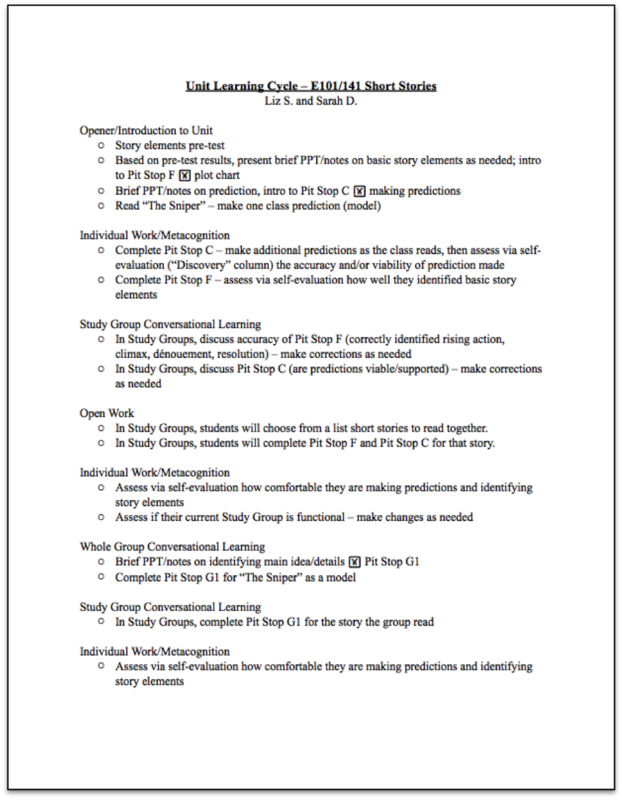 Vary working group size between whole class, individuals, pairs, and study groups. Vary agency between teacher-directed and student-directed activities. Vary the daily routine by surprising students with something exciting and novel at the start of the period. Vary synchronized activities, where everyone is doing the same thing at the same time, with open work time, where the class diverges into a number of activities at the same time. Spontaneity wakes students (and you) up. Flexibility shows them that their experience of learning is more important to you than marching through the planned curriculum. Meaningful learning requires context. One of the central tasks in introducing new material is to explore why it is worth knowing. How does the new concept connect to what the student already knows? How does it relate to the rest of the course? How is it connected to the real world? Without focusing on those links, concepts run the risk of becoming meaningless factoids, and the act of trying to learn them becomes tedious. Without context, students are more likely to revert to the bad habits of doing school. Learning skills requires careful scaffolding. As described in “Unit Contracts”, establishing a sequence of subskills that build towards complexity is essential in designing a learning sequence. How big those steps should be, and how quickly they should be introduced, are two design factors which must be responsive to the needs of the students. Exploring first. Exploration can also occur before an introduction to new material. Exploratory experiences with minimal guidance can pique a student’s interest before it is even defined as the next topic. In science, for instance, open-ended exploratory lab activities given without explanation can get them to begin the process of making sense of the subject. Furthermore, student work that “activates prior knowledge” can be an important tool in generating interest and can remind students that they already know some of the material even before it is formally introduced. Having students create a “KWL” chart is one such approach. In this kind of activity, students identify what they already know about a new subject (K), and what they want to know (W), before they are even introduced to that subject. In the final column (L), students list what they have learned when the unit is completed. Metacognitive work is an essential component of every learning sequence. As often as is practical, students should be aware of the state of their understanding. It guides their actions, and, as they become more self-directed and self-disciplined, it will cause them to ask questions and seek help when they need it. Metacognition is one of the central aspects of successful learning. Metacognitive work should generally precede conversational learning. Conversational learning should be included in the learning sequence whenever possible. Both because socializing is more fun than sitting and listening, and because conversation engages students directly in the learning process, it should be a mainstay. The length of the conversation can range from a few minutes to a whole period. In general, some conversation should occur every day unless there is a compelling reason not to (like taking a test). A check-up or self-assessment should always precede open work time. Check-ups or other non-graded assessments are the means by which you know it’s time to differentiate. They are also the principal tool by which students sort themselves into working on the appropriate level of difficulty. Pay close attention to the spread. Whenever the range of mastery gets so wide that some students are starting to get bored and others are feeling lost, it is time to take action. As you are planning, such junctures will call for “sharing the wealth” in some form and/or differentiated learning. If the purpose of school is to prepare students to live life well, then surely one of our goals is to teach them to be responsible and self-directed learners. Schools often fail to cultivate these attributes in students, even successful students, because they are rarely given the opportunity to practice the skill of making good decisions, of having agency over their learning. To put it simply, they are told what to do too much of the time. An important part of the design of a learning sequence, then, must be to minimize teacher-directed activities and maximize student-directed ones. The focus of pedagogy must shift from skillful delivery of content to the facilitating of self-directed learning. When designing a learning sequence, an important variable therefore lies in who is actively engaged during each block. Are students working alone, in groups, or as a whole class? More importantly, who is steering the process? In order for students to become responsible and self-directed, they should have choices in the learning process as often as possible. Notice that only three of the eight blocks include teacher-directed activities, and even those can be partially or even completely student-directed. Keeping this in mind will help you design a learning sequence that fosters responsibility, independence, and self-directedness in your students. There are many ways to put all of this together to create a plan for the learning process throughout a unit. You can create a Roman numeral-styled outline, write a narrative sequence, or use a flow chart to describe the process. Here are three examples in a flow chart format, followed by a set of examples with different styles. After watching a demonstration of a tablecloth being yanked out from under a candle-lit dinner setting (without explanation), students begin rotating through a station lab of activities involving cars crashing into each other, videos of crash test dummies at work, and “magic” tricks where coins fall straight down into a cup. Each activity has a set of open-ended questions about what students are observing which they discuss with each other, and then write about in their journals. The next day, the teacher introduces the law of inertia. After eight to ten minutes of lecture, students talk to their neighbors about what they just heard, then write class notes in their journals. After several rounds of lecture/discussion, the class debriefs the activities they did yesterday. Homework that night consists of reading the textbook chapter on inertia. Students summarize in their own words the major ideas and supporting arguments of each section. They then assess their level of understanding of each section on a 1 to 5 scale, and write down a note to remind them of anything they didn’t understand. The next day, students get into study groups, review the reading and discuss any questions that anyone had. They then use assigned questions at the end of the chapter as a springboard for discussion and write answers in their own journals. At the end of the period, each student does a check-up of their understanding by answering several questions about the topic as a “ticket to leave”. Over the next day and a half, there are a number of activities for students to choose from, based on the results of the check-up and any remaining questions they have about the homework. All available activities are listed on a learning contract. Activities range from remediation (including a workshop led by the teacher) to enrichment activities to challenge students who have mastered the concepts. At the end of the open work time, there is a brief, whole class review of the material led by the teacher. The next day, students take a test on the subject. The teacher introduces the concept of graphing functions in a lecture format. After explaining what is entailed, she does a number of problems. After no more than 10 minutes, students in their study groups work through similar problems together. This process is repeated several times, with the teacher resuming each lecture segment to introduce the next level of challenge. Near the end of the period, students are given a three question check-up. When they are done, the answers are given. After self-assessing their success, students are given a choice of homework. Students who did not show mastery on the checkup are given review problems with “helpful hints” to guide them when they get stuck. Other students are given enrichment activities to work on. The next day, students convene in their study groups and go over the homework with answer keys. Students who struggled are given a one question check-up when the study group is done, and based on that check-up, they are given another practice problem set on the same skill to work on independently. When the study groups are done, the teacher delivers a lecture on the next skill to be learned. The process described above is repeated. When all the new skills of the unit have been introduced and the level of mastery has diverged to a point where differentiated activities are needed, students take a larger scaled checkup on all the material. This can be considered a “pre-test”, although it is not for a grade. The students are given answer keys and a mini-contract that steers them on what they should work on next. Over the next two days, students work on items listed in the contract. Open work time gives students the opportunity to work alone, in groups of their choosing, and in workshops led by the teacher and/or “resident experts”. At the end of the open work time, students are given answer keys for all mini-contract work and are given time in their study groups to review them. The teacher then reviews the major concepts, giving the skills context in terms of what they have already learned and what they are about to learn in the next unit. Students take the test. When the test is returned, they review it in study groups. Students who didn’t master aspects of the unit are given more practice problems in the areas they need to work on. Having shown they have learned from their mistakes, they then take a retest. The teacher delivers a power point slide show and lecture on a new topic. As always, she only talks for 8 to 10 minutes before allowing students to process what they have learned through writing or conversational learning. She repeats this cycle of lecturing and processing throughout the whole period. The students have reading homework. They assess their level of understanding and create questions to ask the next day. After a question-and-answer session, the teacher continues introducing the new material and the process described above is repeated, with new homework. Students are given a mini-contract with a number of activities based on the material covered thus far. They can do this work at home and/or during a single period of open work time. The final day of the section, students review what they’ve learned in study group discussions, guided by prompts. They are given an AP question on the topic to complete at home in a timed setting. They then assess how well they did on the question using the same rubrics that are used to assess AP tests. 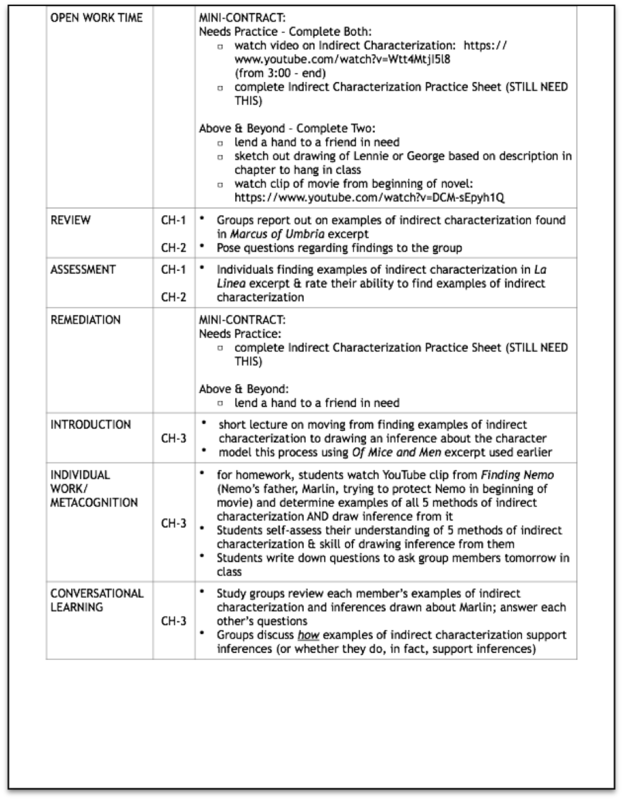 The next day, students get in pairs, exchange their questions, and evaluate them for each other using the same rubric. These are then handed in to the teacher, who adds or modifies the student-based assessment. Based on her evaluation, students are given a chance to rework the question and improve it. The teacher concludes the period by starting the next section of the unit, in which the above process is repeated. Once you have designed the learning sequence, it is time to do a thought experiment on how well it will work for the whole range of your students. To do this, first imagine being a high-achieving student who masters new material quickly. Now march through the sequence, observing it through her eyes. Does every part of the process support genuine learning? Are there moments where she is likely to be bored? If she finishes an activity more quickly than her peers, is there always something meaningful for her to do? Does she have ample opportunity for enrichment activities and/or sharing the wealth with less successful students? Now imagine being one of your least successful students going through the same sequence. Perhaps she has less motivation to learn, has a poorer background in your subject, or simply takes longer to understand the new material. Is the process you designed responsive to her needs at every point? Will she enter the panic zone at any juncture in the process? Are complex skills broken into sufficiently small subskills for her to be successful? Is remediation available to her whenever she needs it? What the learners need should be the central criterion in creating the design. If those needs are met for the whole range of students in your class, your design is ready to implement. If not, add or modify elements to make the process more responsive to every student at every point in the sequence. Introduction. If students enter a unit of study with very different backgrounds, it may be appropriate to introduce the material in different ways based on their prior knowledge. In a physics class, for instance, a student with strong mathematical skills may need a different introduction than a student who struggles with algebraic equations. While some students can, from the beginning of a unit, dive into more sophisticated understanding, others may need a slower and more deliberate introduction. Exploration. During the exploration of new material, differentiated activities should be available for students with varying levels of prior knowledge or adeptness in grasping new concepts or skills. Individual work/metacognition. An individual student’s work can be differentiated to allow her to assess her own understanding at the appropriate level of challenge. Based on feedback, a student could choose more or less challenging work, , whether in class or at home, and have the experience of assessing her level of mastery at that level. Conversational learning. Within open work time, structures that encourage students to share the wealth can be created, whether in study groups or ad hoc groupings. Review. Before any test or exam, sufficient feedback, perhaps in the form of a pre-test, can allow individual a student to identify and review those specific aspects of the material that she hasn’t yet mastered. Remediation. Learning from one’s mistakes should, of course, be based on what mistakes each student has made on an assessment. Differentiation of both review and remediation are discussed in detail in “Making Tests Meaningful”. In every phase of a learning sequence, it is important to consider the range of needs of individual students, and to use differentiated activities to respond to those needs. Reviewing the learning goals. Before students can use their time effectively, they should be reminded of what they are actually trying to accomplish, namely mastering the learning goals. These goals need to be reiterated by the teacher and should be visible in the classroom as well as described orally. At the end of the open work time, it is useful to briefly review the list, so that students can assess how well they did in mastering those goals. Introducing all available contract items. In order for students to make good choices, they need to know what they are choosing from. Presenting all the available work at the start of open work time, with a brief description of the purpose of each item, will help give students the clarity they need to decide what to do. Dealing with excessive noise and chaos. Students may need to be reminded of one of the basic rules of a community of learners: no one has the right to interfere with anyone else’s ability to learn. Students often need training in how to be aware of the good of the whole group. Your task is to help students internalize the understanding that a noisy, chaotic classroom is an impediment to learning, and therefore something each one of them needs to prevent from happening. The more they own that responsibility, the less you will find yourself in the position of nagging them to be quiet. Using your time effectively. Once students are able to truly work independently, you will discover that you have time to work in new ways. These can include moving around the room to monitor their progress, setting up the next task, having individual conversations with students, or spontaneously organizing a workshop on a topic that some students are struggling with. Another advantage of open work time is the fact that it makes problems in motivation and execution more visible. If students are sitting in rows, nominally listening to a lecture, there is no way to truly know how many are mentally engaged. When everyone is working as individuals or in small groups, it becomes much harder for a student who is unmotivated and disengaged to evade being noticed. This presents the opportunity to have a nonjudgmental conversation to get to the bottom of whatever issues are interfering with her participation. This topic is explored in more detail in the chapter on study groups. Determining the appropriate length of open work time. Since students, by definition, do different tasks during open work time, it is a challenge to know when everyone has had enough time. Even in more traditional situations, where every student is working on the same thing at the same time, some students finish much sooner than others and then have nothing to do. Learning contracts resolve this problem in several ways. First, stronger students are engaged in more challenging tasks, which take them longer than the one-size-fits-all tasks they typically finish faster than their peers. Second, the contract structure provides other things for quicker students to work on once they have finished the present work. Nevertheless, there is a need to find a “Goldilocks” solution to how long open work time should last. As a rule of thumb, the right amount of time allows the slowest students finish or nearly finishthe work required to master the learning goals. Depending on the dynamics and motivation of the student body, it is fair to assume that slower students may need to take some of the contract work home. Of course, the slowest students may also be the ones who historically complete less homework, so that pitfall must be taken into account. In general, listening carefully to feedback from both the fastest and slowest students is important in steering the duration of open work time. This requires you to trust that they are reporting their work honestly. That honesty is a measure of how well the culture of learning has taken root. Finally, taking good notes on how long specific contract tasks take will help enormously when you are making plans next year. Wrapping up open work time. Near the end of extended open work periods, it is important to remind students of the learning goals they have been working on and have them assess how well they have mastered those goals so that they can use the remaining time effectively. For longer contracts, you should periodically give them time to look at how many items they have completed compared to the minimum required. Remind them that unfinished work can be completed as homework, if that’s appropriate. Giving that reminder before the very end of the open work time may help some students from procrastinating, piling up the work and turning it into last-minute busywork. The purpose in the design process is to be responsive to the learning needs of every student in the room. That requires that both you and your students are aware of the state of learning as it truly is, not as it should be. This requires a consistent stream of feedback. Neither you nor your students can steer the learning process well without it. In many classrooms, the principal form of feedback to a student is her grades, and especially quiz and test scores. Unfortunately, for many students this feedback is too little and too late. What is needed is more timely, subtle, frequent, and multifaceted feedback. Furthermore, graded feedback often has unintended and counterproductive side effects, particularly in the realm of a student’s motivation. This issue is discussed in full in “Grades Reconsidered”, but for now, suffice it to say that whenever grades are involved in the feedback process, they tend to undermine genuine learning and displace it with the destructive habits of doing school. There are times when graded work such as tests and quizzes can provide useful feedback for both student and teacher, but in general it is essential to separate feedback from grades. This allows you and your students to check up on their proficiency more frequently, and, most importantly, without any sense of judgement. Once a new idea has been introduced and some work has been done by the class to process it, there will be a juncture where it is time for students to begin doing differentiated activities. Feedback at this moment helps students understand how well they have mastered the new material and what they should do next. It can be considered a mechanism of self-sorting, a way for students to determine what contract items will be most useful for them. Once the period of differentiated activities is done, it is important to have another feedback mechanism to help students and the teacher confirm how well those activities have helped all students master the material. This, in turn, might lead to further review items for some students, for whom the differentiated activities weren’t sufficient. Feedback sets the pace of the class. Feedback also helps the teacher to judge how well the class is doing with new material. It makes the range of understanding visible. Is there a huge gap between those who have mastered the material and those who haven’t? Is the number of students who are struggling small enough to work with them alone, or does the whole class need to slow down and revisit recent material? Such questions are important enough to warrant frequent “snapshots” of students as they report their self-assessed status. The subject of feedback — the many forms it can come in, the varied functions it can serve — is discussed in full in “Grades Reconsidered”. A focus on the learning process is the most important factor in determining what excellent teaching looks like. Therefore, designing the learning sequence that students experience precedes designing lesson plans. Determining what activities are most useful at any point in the sequence is based on what a student needs. That is best accomplishedby leaving the teacher’s point of view and entering that of the student. Understanding the reality of a struggling student or a successful student at any moment requires an understanding of their emotions. What does it feel like to be panicking or to be bored? It provides the appropriate level of challenge and support, regardless of the student’s level of readiness to learn. If it is too vague, it doesn’t help the student isolate the difficulty. If is too late, it undermines the motivation to learn from mistakes. Feedback should be ubiquitous in the learning process. Having it show up in a wide range of forms ensures that it will be useable for a range of students. In a high-functioning learning environment, feedback is woven into the fabric of every activity in small ways and large. It is informal and formal, it is verbal and written, it is between every person in the room and every other person in the room. It is the language a community of learners speaks. When you listen, you become a more responsive teacher. Feedback is your fundamental tool in responding to students’ learning needs. It also allows you to set the pace of the class appropriately. And students must listen to feedback in order to become self-directed learners. Keep lectures simple. After ten minutes of your talking, students should have an opportunity to actively process the new material. In general, lectures should be restricted to introducing work that students cannot effectively discover any other way. As tempting as it is to spell out written instructions in great detail, keep it as concise as possible. To paraphrase Einstein, instructions should be made as simple as possible, but not simpler.